Built in 1980, the Atlanta-Fulton Central Library looks unlike most of its surrounding structures, serving as a counterpoint to the face of historic downtown in the same way that the Guggenheim Museum in New York City contrasts with its neighboring buildings. Designed by famed architect Marcel Breuer, this outstanding example of the Brutalist style is perhaps one of the most recognizable modernist structures in Atlanta. The design can be viewed as an evolution of the earlier Breuer-designed Whitney Museum of American Art in New York. In 2008, Fulton County announced plans to restructure the library system. A part of the Master plan involves constructing a new Central Library. The Atlanta Preservation Center has advocated for the preservation of the Atlanta-Fulton Central library since 2005 for the unique quality and significance of its architecture, its internationally important architect and its place as an anchor building in a reviving portion of historic downtown. 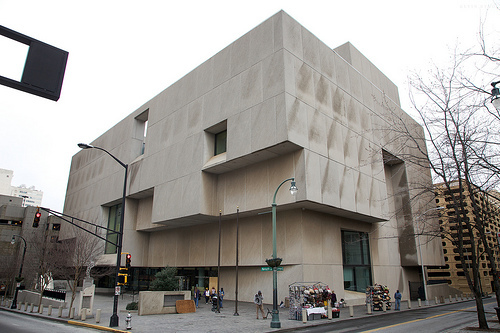 The Atlanta Preservation Center is among many groups to recognize the importance of the Breuer-designed library. Worldwide appeals for the preservation of the library are testaments to the significance of this building. Numerous articles in the past year have offered information on the importance of the library and its ongoing fight for survival. A selection of these is offered in the links below. Currently a petition is being circulated in support of the preservation of the library. If you would like to help by signing this petition, please click on this link.